Alexis Sanchez scored his first Manchester United goal since October with a delightful finish after a brilliant ball from Romelu Lukaku. 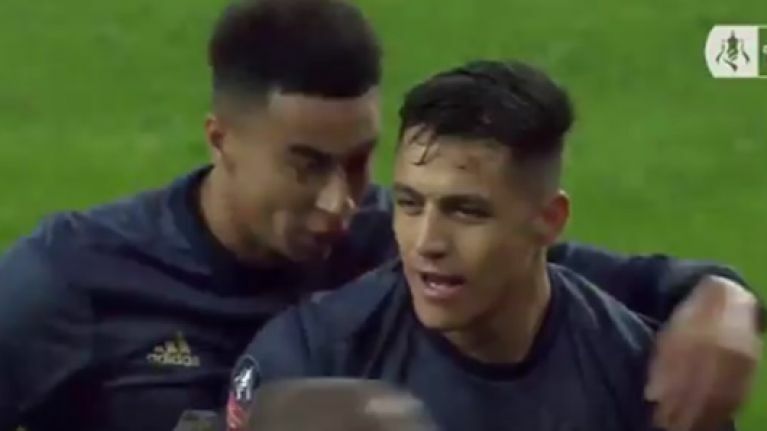 Sanchez gave United the lead just after the half hour mark in their FA Cup fourth round tie with Arsenal before winger Jesse Lingard extended the visitors advantage two minutes later when he finished off a brilliant move to tuck the ball inside the right post. Arsenal forward Pierre Emerick-Aubameyang pulled one back for Arsenal just before half-time with both teams attacking each other in an end-to-end game at the Emirates Stadium. United could have had a third goal if midfielder Paul Pogba had have got on the end of a Jesse Lingard goalmouth cross but manager Ole Gunnar Solskjaer said the French international may be a captain at the club, which is a far cry from where he was under former manager Jose Mourinho when he was on the bench for his final game in charge during the 3-1 loss to Liverpool last month. “He’s a character, he influences people, he cares and he really wants to be successful,” United’s caretaker manager said. “I know him from before [Pogba’s first spell at the club when Solskjær was on the coaching staff] and when he’s enjoying himself he brings so many good things with him.